Dyane Distraction Dilemma – HubNut – celebrating the average! I went to look at a new car the other day. I think the lack of aircooled Citroen action is starting to get to me! 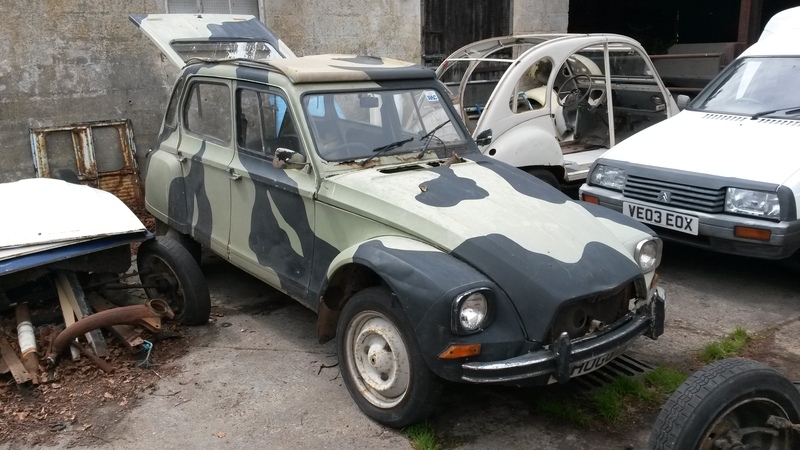 So, I ended up considering a little project that might help fill the gap until I can get Elly the 2CV restored. It may seem silly to spend money on another project, as this’ll surely pull funds away from the 2CV restoration fund. It will. Which is why I haven’t entirely made my mind up yet. 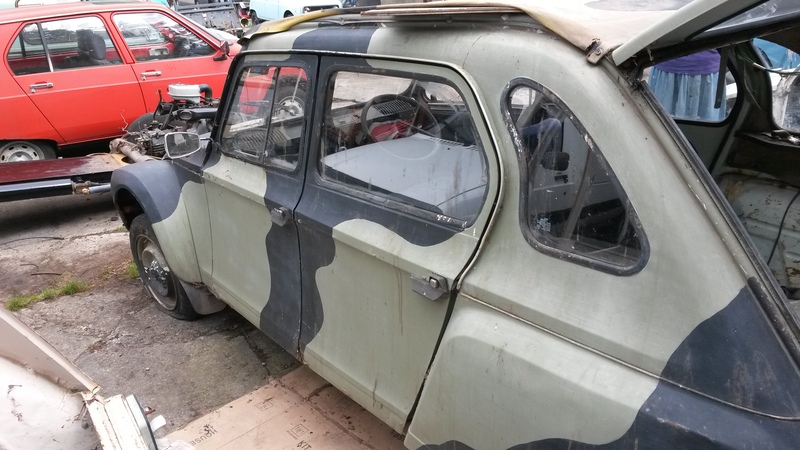 This Dyane certainly needs some work, but having now looked at it in the metal, it needs far, far less bodywork than my (younger) 2CV. One shabby, yet delicious project. Oh. Did I forget to mention that someone had painted it in a camouflage stylee? Yes. They even painted the roof. This bothers me not at all, because I’m looking for an ‘art project’ anyway. This is because there simply are not enough hand-painted 2CVs (and derivatives) at events these days. Too many shiny cars! As you can probably see, the panel beneath the windscreen is pretty bad. Ideally, that needs replacing – though I’d attempt to put that off until it is at least road legal again. It needs a few small patches to gain an MOT, and the price agreed with the vendor is firmly on the side of acceptable. Needs a roof, but body is largely very solid. May also need wheels/tyres. We got the engine running, and it sounds very sweet. There were discussions about getting the car MOTd so I can drive it back, whereupon I can try and fettle it into rather better condition – the long-term plan would be to enjoy it while the 2CV is off the road, then sell it again when the resto project needs a financial kick. Having recently received a tax refund, it would be nice to have something ‘nice’ to show for it! I must admit, I really like Dyanes. The idea of getting another 2CV isn’t appealing, and my meagre budget is certainly not going to see me behind the wheel of a super-desirable Citroen Ami 6 anytime soon. I clocked up 14,000 miles in a year in my first Dyane. They are quite remarkable machines – like a 2CV, but just a little bit better. The doors don’t flap around on the motorway, the windows are a bit more practical (sliding rather than folding) and there’s a useful hatchback. They are also a little wider, with much more elbow room. Impressively, Citroen sold 1.4 million of them, though it was still outlived by the 2CV. Whether this is the right car for me right now remains to be seen. A few more discussions need to take place, and I need to ensure my man maths actually stand up to greater scrutiny! Quite a few people have expressed interest in the C15! Not me though. Too many cylinders. “Which is why I haven’t entirely made my mind up yet”. So, when do you pick it up? Ha, will look forward to it!